(Excerpt from Goodreads) A Man of Genius portrays a psychological journey from safety into obsession and secrecy. It mirrors a physical passage from flamboyant Regency England through a Europe conquered by Napoleon. The pair leaves London for occupied Venice, where Ann tries to cope with the monstrous ego of her lover. Forced to flee with a stranger, she delves into her past, to be jolted by a series of revelations–about her lover, her parentage, the stranger, and herself. This story starts in 1816 in London and ends in Venice. Ann is a successful gothic novelist and one of a few women that are starting to break ground in this area. Ann meets another writer, Robert. At first she is fascinated with him but ends up finding herself obsessing about him and his genius. Robert starts out interesting but the longer Ann is with him and his selfish, violent behaviors she starts seeing his true personality. But although she sees the truth she also cannot find it in herself to leave. This is an amazing story. 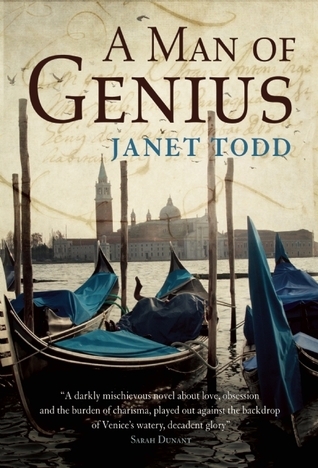 You can tell that Janet Todd has a lot of knowledge about the 18th century and London and Venice. I found myself instantly falling into this story. Ann is such a strong, independent woman yet finds herself with such an unstable partner. All I could do was sit back and pray that she could survive this relationship. It’s a topic that you see often but it is executed perfectly in this story. The rich environment just makes this book even better. If you like historical and gothic stories you need to get this book. I admit that I am not usually a historical reader but I’m very glad that I received this book. To purchase A Man of Genius make sure to check out Amazon, Barnes and Noble, and Goodreads. I received A Man of Genius for free in exchange for an honest review.